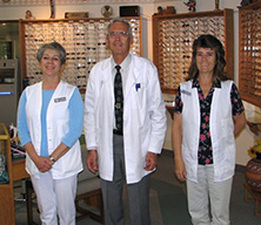 Dr. Cooper has lived in Southwestern Colorado all his life and has been in practice in Montrose for over 45 years. He is a graduate of Illinois College of Optometry in Chicago. His is a member of the American Optometric Association, Colorado Optometric Association, Association of Seventh Day Adventist Optometrists, Volunteer Optometrists Serving Humanity, and other organizations. Pam has been working for Dr. Cooper for many years and is thoroughly knowledgeable in all aspects of frames, lenses, contact lenses, repairs and adjustments, and will be happy to assist you with any optical decision you might have.